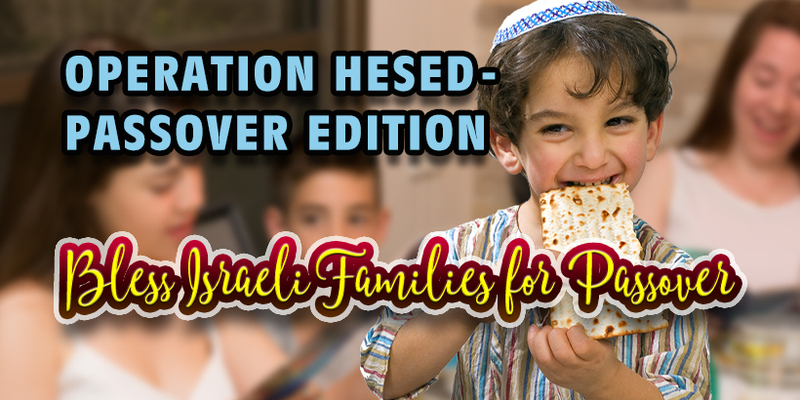 The “Operation Hesed: Passover” project is underway! We are excited for this year’s Passover project, as we expect to help feed hundreds of families during this special time in Israel. Passover is one of the most significant feasts for the Jewish people in Israel. It is a time when people gather together for a festive meal with immediate and extended family and friends. However, there are many families in Israel who are struggling financially, and are unable to contribute to the festivities, placing a great burden on them. This is where we come in! In our efforts to build God’s kingdom, we cannot forget to be gracious to those in need. It is a great joy to be a source of blessing during this special season so that all can participate in the Lord’s appointed times here in Israel. We invite you to partner with us in this initiative! Join us as we extend the Lord’s hand of blessing to families who have fallen on hard times during this Passover. Thank you for your faithful prayers and support of our ministry as we extend His love to the people of Israel. Together, we can truly be a blessing in Israel during this special celebration!